The various ingredients may originate in different parts of the Earth but come together congenially to make this dish. Although I have been making these spicy toasts for a long time, I wasn't content until this recipe evolved through trials and time. Now this recipe is not only nutrient-rich and low in fats, but also quite delicious. I make the topping ahead of time and keep it in the refrigerator. Once the topping is made, it takes a jiffy to turn out great tasting snacks. They are great for breakfast or as an accompaniment with soup or salad for a light meal. They are just as delicious but with hardly any carbohydrates if made with hollow vegetables as suggested in the variations option. Enjoy! Makes enough topping for 12 pita breads. Allow 1/2 pita bread or one English muffin per person for an appetizer serving. I use low fat cheese and whole grain breads for maximum nutrition and taste. 1 Container Tofu, any type 14 oz. 1 cup grated Parmesan Cheese, 4 oz. 1 cup grated low fat Mozzarella, Jack, or Cheddar Cheese (or a blend), 4 oz. Mash the tofu well. Combine all the ingredients for the topping in a bowl and mix thoroughly. Divide the topping among 12 whole wheat pita breads. Spread to the edges, place in a 400 degree F oven or toaster oven and bake until topping is bubbly and lightly browned. Other breads such as English muffin halves, or halved baguettes may be used instead of the pita breads. Remove and slice into wedges or bite sized pieces. Serve hot. Variations: The tofu topping can be used to fill vegetables such as hollowed zucchini boats, quartered bell peppers, etc (instead of being spread on bread) and baked until hot and lightly browned and served as appetizers or side dishes. Here is an exotic and delicious dish often served with Pongal. The roasting or broiling not only adds a smoky flavor, but also brings out the best in the eggplant and chili. The best way is to roast over hot coals; but broiling or roasting in an oven will produce good results as well. If roasting is not feasible, go ahead and make it with raw chopped eggplant (I do sometimes if in a hurry); it still makes a wonderful dish. But do make this dish with roasted or broiled eggplant too when you can. For best results, choose bright, glossy eggplants - they tend to be fresher, tender and more flavorful. How to roast: Wash the eggplant and chili thoroughly and wipe dry. Roast in a 400 degree F oven turning to cook all sides until the skin in blackened and the vegetables are soft (about 20 to 30 minutes). Alternately hold with tongs over gas flames and cook on all sides. Cover and set aside until cool enough to handle. Covering well is important as it helps the eggplant to sweat as it cools which makes peeling easier. Peel off the papery skin with the help of a small sharp knife and save all the juices and flesh from both the eggplant and chili. Do not be tempted to peel under running water or rinse the roasted veggies; the flavors will get washed away as well. Chop or mash coarsely; set aside. If using raw eggplant, chop into small cubes and add directly to the tamarind water in the next step and cook until soft and easy to mash with the back of the spoon a little. Place the salt, brown sugar, turmeric, Sambar powder, and tamarind paste in a 2 quart stainless steel pan with 3 cups of water. Bring to a boil, turn heat down and simmer until the liquid has thickened slightly, about 5 to 7 minutes. Stir in the mashed/chopped eggplant and chili mixture and bring to a boil. Remove from heat and cover. Peel the onion and chop finely while the gothsu is cooking. Heat a small pan with the oil and add the seeds and red chili. When the seeds pop, add asafoetida and then the onions and curry leaves. Cook, stirring, until the onion is soft. Add the whole thing to the gothsu. Add chopped cilantro and stir well. Let sit for 5 to 10 minutes for the flavors to develop. Serve hot, warm, or at room temperature with Pongal, Dosa, Tofu Yogurt Rice, etc or as desired. Variations: If roasting is not feasible, the eggplant can be grilled. Slice and coat with a little oil and grill until soft and browned a little. The chili can be grilled whole or sliced; leave the core and seeds in for a spicy dish or remove them for a milder dish. 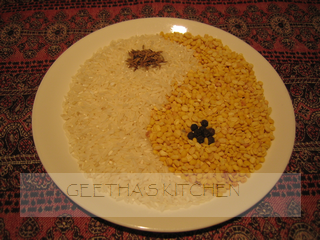 Here is another delicious rice which is mild but flavorful. Frozen corn makes it a snap to prepare it. When rice is enhanced with a Tadka/Thalippu and various ingredients, it belongs to the category of "Chitrannam" which literally translates as 'beautiful food/rice'! Chitrannam of one kind or another is a must on special occasions and as children we looked forward eagerly for these holidays. Amma would often make them as a special after-school treats with whatever vegetables were on hand. Enjoy! Wash the rice well and let sit; bring the water to a boil with the salt. Add the rice and cook until done. Let it cool for at least an hour. Peel and chop the onion. Cut the Jalapeño in half lengthwise, remove the core, and mince finely if using. Thaw the frozen corn by bringing it to room temperature. Heat the oil in a large kadai or skillet and add mustard seeds and urad dal. When the dal turns pink and the mustard is dancing, add asafoetida, onion, chili, curry leaves, and a pinch of salt. Cook, stirring until onion is soft. Add the rest of the ingredients and cook stirring until corn is hot. Stir in the cooled rice and mix gently in a lifting-folding motion with a thin spatula so as not to mush the rice. Mix well and heat covered over very low heat until hot, about 5 to 10 minutes. Or transfer to a baking/serving dish and heat in a 350 F oven until hot. Serve hot, warm, or at room temperature with curries, papadams, salaad, or any type of raita or as desired. Enjoy!! Note: When cooking rice I usually do the following: when the rice and water comes to a rolling boil, stir well, return to boiling, and turn off the heat. Cover and leave it undisturbed for 20 minutes. This process produces lovely fluffy rice every time - no more mushy or burned rice :) and frees one from having to watch the pot! Also, it is an environment-friendly method as well since it saves fuel :). Here is a much celebrated Italian rice dish; I have added a little Indian influence of Ghee and sambar powder :)! 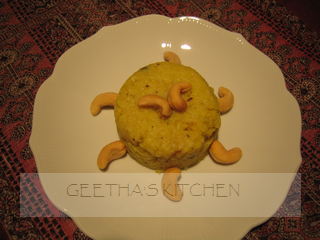 It is similar to the Indian Kichdi or Bisi Bele Rice in idea as well as texture. Enjoy! I generally do not use any broth; the vegetables and the herbs provide ample flavor. If you like to use broth instead of water, you certainly can make home-made vegetable broth with all the trimmings from the vegetables and simmer them gently in fresh water to cover with a clove of garlic or two, a coarsely chopped tomato, an onion and a potato each, a sprig of each of the herbs mentioned below, and a little salt. When cool, strain and discard all the vegetable pieces and use the broth as you wish. If there is extra broth, it can be frozen for later use in soups or other recipes. Spread the pine nuts on an ungreased baking pan and toast them in a 350 degree F oven for about 7 or 8 minutes. Cool and set aside in an airtight container. Wash the rice and drain in a sieve. Let sit while preparing the vegetables. Heat the water in a kettle and keep it hot. Wash and dry the eggplants and the mushrooms. Cut into small bite sized pieces. The leeks require a thorough cleaning: remove the root end and most of the green leafy parts leaving only about 2 inches of the green. Slice in half lengthwise and wash thoroughly in plenty of water to remove soil and grit from between the layers. Drain well and slice crosswise thinly into semicircles. Wash and trim the root end as well as the leaf stalks close to the fennel bulb; slice thinly into quarter circles. Wash and dry carrots, zucchini and tomatoes. Peel carrots if desired and cut all the veggies into bite sized pieces. Strip the leaves from all the herbs; chop coarsely. Keep the parsley and the leaves from one sprig of basil separately. Heat one Tbsp of the oil or ghee and cook the mushrooms and eggplant with a pinch each of turmeric, salt, cayenne and black pepper until the veggies are tender and browned a little. Remove and set aside. Heat the rest of the oil or ghee to the same pan: add the leeks and fennel with the rest of the turmeric, cayenne, salt, and black pepper. Cook until the vegetables are softened and are beginning to color. Stir in garlic and the sage-basil-marjoram mix and cook for one minute. Stir in the rice and mix well; keep stirring for about 3 minutes until rice is coated well and is a little translucent. Add 5 cups of hot/boiling water (or broth) from the kettle and simmer until the water is almost absorbed, about 30 minutes. Stir in the carrots, zucchini and tomatoes with a cup of boiling water. When the water is almost absorbed, stir in the eggplant and mushroom mixture with another cup more of the boiling water. Stir and cook for 5 minutes. Add a little more of the hot water if the risotto looks too thick; it should be moist but not soupy. Turn off the heat and stir in the chopped parsley and basil mixture. Cover and let rest for 10 minutes. Serve in warm bowls or plates with a sprinkle of the Parmesan cheese, pine nuts, and additional freshly ground black pepper to taste. Note: I always make a little extra because it tastes so good the next day. Serve with crisp fried or roasted papadams, a fresh green salad and/or raita. The yogurt in the raita, the lentils in the papadams, mushrooms, nuts and rice all contribute ample protein to make it a hearty meal. The vegetables and the herbs also contribute some proteins, abundant vitamins, and minerals essential for good health. The vegetables mentioned above are just a few possibilities; change them according to what is available seasonally or according to your preference. Gothsu or Gojju is an intense, spicy, sweet and sour saucy dish traditionally eaten with Pongal or VenPongal. It is great to eat with rice and vegetables, snacks such as Dosa, etc. Generally it is made with any type of sweet flavored winter squashes, eggplant, etc. Gothsu would be considered as a "kozhambu" or saucy curry category of food in the South Indian culinary repertoire. Here is one version of gothsu. Wash the squash thoroughly and wipe dry. Cutting the Kabocha Squash is a little tricky. Place the squash on a cutting board securely and use a heavy, sharp knife carefully to cut it in half. Scoop out the seeds and fibers and discard. Kabocha has a thin skin so does not need to be peeled; but peel if you prefer. Butternut squash has thick skin; so it must be peeled. Chop coarsely; set aside. Cut the stem off the chili and slit about half way. Place the chopped squash pieces, green chili, salt, brown sugar, turmeric, Sambar powder, and tamarind paste in a stainless steel 2 quart pan with 3 cups of water. Bring to a boil, turn heat down and simmer until the squash is very soft and the liquid has thickened, about 20 minutes. Mash the squash pieces a little with the back of the spoon. Peel the onion and chop finely while the squash is cooking. Heat a small pan with the oil and add the seeds and red chili. When the seeds pop, add asafoetida and then the onions and curry leaves. Cook, stirring, until the onion is soft. Add the entire contents to the squash. Add chopped cilantro and stir well. Serve hot or at room temperature with Pongal, Dosa, etc or as desired. Pongal is a festival in South India as well as the dish made with the newly harvested rice eaten on that day. Traditionally two types of Pongal are made - savory VenPongal and sweet Shakkara Pongal. Although VenPongal means white pongal, the dish is usually yellow because of the turmeric in it. I make sure to add the wonderful golden turmeric in our Pongal especially since it is known prevent lesions in the brain which are found in people with Alzheimer's disease. I am sure everyone has heard (as it had made headlines sometime ago) that one of the components of turmeric, curcumin, is what apparently prevents the lesions. Turmeric is one of the spices used daily in Indian cooking as Ayurveda, the ancient science of health from India, says that it has many good health benefits (antioxidant, antiseptic, anti-lesion, etc). According to my grandmother cooking the vegetables with a pinch of turmeric prevents toxins from being formed. I loved waking up on cool winter mornings with the fragrance of Pongal in the air not only from our kitchen but from the neighbors' kitchens too :)! It is traditionally made all over South India especially during December-January time. Warm, golden Pongal makes a very satisfying and cheery meal with its rib-sticking quality from the perfect amounts of proteins and carbs from rice with mung dal. The knowledge of the ancient sages of India who designed the way we eat are truly amazing as medical science is only now discovering the benefits of eating herbs and spices regularly. There was just one teeny tiny problem! I would start roasting the dal and before too long the high-pitched keening of the fire alarm would announce in no uncertain terms that someone got distracted in the kitchen! Now, thanks to the oven method, fire alarms no longer jar my family out of their sweet slumber (or burn and waste good dal either :} ). The oven makes short work of roasting the dal; .... look Ma, no stirring and more importantly - no burning! - very quick and painless indeed. Isn't the oven marvelous :)? I roast a quantity of dal and keep them in an airtight container so I can make Pongal even on a week day! Pongal is an amazing and healthy food that requires just a few ingredients; the only spices required are turmeric, whole cumin seeds and fresh black pepper. Sort the dal for stones or discolored beans. Spread in an ungreased baking pan and roast in a 350 degree F oven for about 10 minutes stirring once or twice until golden and fragrant. Remove from oven and let cool. This step can be done a few days ahead. If made ahead, keep the roasted dal in an airtight jar. This is the time to decide if you would like the Pongal to be fluffy or soft and creamy. We like it on the soft side and some like it fluffy. It is simply a matter of the quantity - the amount of water you add and whether it is stirred a little or a lot. Heat 4 cups of water for soft pongal ( 3 cups of water for the fluffy type) in a heavy-bottomed 4 or 5 quart (or liter) Dutch Oven or stock pot; you can add more water as required. When the water comes to a boil, add turmeric, salt, and the rice mix. Bring to a boil again and then lower the heat to simmer. Stir only once and turn off the heat after 15 minutes if a fluffy product is desired. Otherwise, cook stirring occasionally until soft and creamy, about 30 minutes or so depending on the heat source and the amount of water. Add a little more boiling water if pongal gets too thick. Cover and set aside. Crack or coarsely grind the black peppercorns and the whole cumin seeds using a mortar and pestle. Spices can also be left whole; some like to leave the spices whole. I crack them coarsely as our family likes the spices homogeneously mixed into the pongal. Break up cashews by hand into small pieces; cashews separate into halves and break easily. Heat the ghee in a small pan and add the cashews and cook until the nuts turn pink. Remove them with a slotted spoon and set aside. Stir in the cumin and black pepper into the hot ghee and when the spices sizzle, add to the pongal. Stir well and let rest for about 10 minutes. Serve hot sprinkled with the cashews and an extra pat of ghee/butter substitute if desired. Pongal is traditionally served with an intense, sweet and sour, spicy, saucy dish called Gothsu (made with vegetables, tamarind, and spices), any fresh chutney, and/or any type of Raita. Note: I love making Pongal with short grain brown rice - brown rice is wonderfully flavorful and healthier than white rice as it provides more protein and fiber. The brown rice needs more liquid though - so I use a total of about 5 cups of water for 1 cup of rice plus the mung dal. Brown rice also takes a little extra cooking time - about 15 minutes more or so. For a fat free pongal, dry toast the whole peppercorns and cumin seeds until fragrant; cool a little and grind coarsely. Stir into the pongal. Oven-roasted poduthul!!! Here is the easiest way yet to make this wonderful and tasty dish quite painlessly! The modern convenience of oven is just fabulous. I roast vegetables in the oven for other dishes often so I don't know why I didn't think of this before. This version is very similar to Puli Kuthi Poduthul - II; the difference is the cooking method. Roasting the veggies in the oven brings out their sweet flavor and as a bonus, frees one from stirring and watching the pot :)! Also okra doesn't get slimy or soggy this way. Another benefit of this method is that you can roast the vegetables ahead of time and then at the last minute put then together! I find that the bananas benefit from steaming on top of the stove or in the microwave; they tend to be too dry roasted. The cooking bananas for this dish are stubby, firm, and green without even a hint of yellow or softness; in some markets they are called burro bananas. Ordinary eating bananas will work also as long as they are very green. Caveat: Puliyogare Mix has peanuts in them; so those with peanut allergies might not want to use this mix. Toast the streusel ingredients in a small pan over medium heat. Stir and swirl the contents often to toast evenly. Pour onto a small plate and let cool. When cool, grind into a coarse powder in a clean coffee or spice grinder. Wash and dry the bananas, okra, and eggplant. Cut off the stems. Peel with a peeler just the thin green outer skin from the bananas, cut into quarters lengthwise, and slice diagonally at about half inch intervals. Cut the stems off from the eggplants; now slice them the same way as the bananas. Cut off the stems from okra and cut them into one inch pieces. Now for the difference in cooking: Coat a baking pan with either non-stick cooking spray or oil. Toss the eggplant and okra pieces with a little oil, sprinkle them with a pinch or two of salt, and spread in a single layer in the baking pan, and bake in a 350 to 375 degree F oven until the veggies are tender - about 15 to 20 minutes turning them once or twice. Set aside. Mix 1/2 tsp salt, a pinch of turmeric, and banana pieces in a microwave proof dish, cover and cook until tender, about 7 minutes. Set aside. Heat oil in a large skillet and add mustard seeds and the dals. When mustard seeds pop and the dals turn pinkish, add asafoetida, curry leaves and all the vegetables. Sprinkle the Puliyogare Mix and the streusel on top, cover and cook on low heat stirring occasionally until well mixed and dry, about 10 minutes. Use a thin spatula in a lifting and folding motion to keep the vegetables intact. Serve hot with plain rice or one pot rasam rice , any dal dishes such as Simple dal or any types of rasam such as the Lemon-Lime Rasam, pappadams and plain yogurt or as you wish. Eureka!! I figured out an easier and quicker way to make this poduthul with the Puliyogare Mix (I used the MTR brand) which is used to make tamarind rice. The dish was all set to go; but much to my dismay I discovered the shelves were bare of tamarind - no concentrate or even the pulp :( I was scanning the cupboard for some inspiration......when lo and behold, I spied the package of Puliyogare Mix! and used it instead of the tamarind paste. Needless to say the experiment was a great success by the fact that there were no leftovers :). Caveat: Puliyogare Mix has peanuts in them; so those with allergies might not want to use this mix. Toast the streusel ingredients in a small pan over medium heat. Stir and swirl the contents often to toast evenly. Pour onto a small plate and let cool. When cool, grind into a coarse powder in a coffee grinder. Wash and dry the bananas, okra, and eggplant. Peel with a peeler just the thin green outer skin from the bananas, cut into quarters lengthwise, and slice diagonally at about half inch intervals. Cut the eggplants the same way. Cut off the stems from okra and cut them into one inch pieces. Mix1/4 tsp salt, a pinch of turmeric, and banana pieces in a microwave proof dish and cook covered until tender, about 7 minutes or so. Set aside. Heat oil in a large skillet and add mustard seeds and the dals. When mustard seeds pop and the dals turn pinkish, add asafetida. Add curry leaves, eggplant pieces, turmeric and 1/4 tsp salt cook covered for 10 minutes. Stir in okra pieces with a pinch of salt and cook stirring until they are tender. Once the okra is added cover only for five more minutes; after that cook until tender stirring often to prevent burning. Use a thin spatula to lift the vegetables from the bottom in a fold over motion to prevent mushing them. Stir in the cooked bananas. Sprinkle the Puliyogare Mix and the streusel on top and cook covered stirring occasionally until well mixed and dry, about 5 to 10 minutes. Use the thin spatula in a lifting and folding motion so that the vegetables don't break up or get mushy. Serve hot with plain rice or one pot rasam rice , any dal dishes such as Simple dal or any types of rasam such as Lemon-Lime Rasam and plain yogurt or as you wish. Enjoy!! We grew up loving this classic South Indian vegetable dish. Puli Kuthi Poduthul literally means "cooked in tamarind with streusel sprinkles". I remember that Thathi (our grandmother) used to make a large pan full of this dish and she would save a spoonful of it to savor piece by piece slowly as the finale of her meal. Arbi or Taro root is delicious and cooks up velvety - the children call them 'velvety potatoes'! The only Caveat is that ARBI MUST BE COMPLETELY COOKED UNTIL SOFT BECAUSE IT CONTAINS CALCIUM OXALATE CRYSTALS WHICH AFFECT THE MUCUS MEMBRANES IN A PINS AND NEEDLES OR TINGLING SENSATION UNLESS COOKED COMPLETELY. COOKING RENDERS THEM HARMLESS BY DESTROYING THE OXALATE CRYSTALS. Arbi or Taro is just like the Rhubarb that must be cooked to be edible; so don't let the warning scare you away :). According to Elizabeth Schneider of The Essential Reference - Vegetables from Amaranth to Zucchini, taro or arbi has probably been cultivated and eaten in many parts of the world for longer than 10,000 years! She says that taro is such a common food that it has hundreds of common names. If you are not comfortable cooking arbi or taro, leave them out of this dish; although it adds its unique taste, leaving it out will not ruin the dish. Toast the streusel ingredients in a small pan over medium heat. Stir and swirl the contents often to toast evenly. Pour onto a small plate and let cool. When cool, grind into a coarse powder in a clean spice/coffee grinder. Wash and dry the bananas, okra, and eggplant. Peel with a peeler just the thin green outer skin from the bananas, cut into quarters lengthwise, and slice diagonally at about half inch intervals. Peel the arbi tubers and cut them into quarters. Cut the eggplants the same way as the bananas. Cut off the stems from okra and cut them into one inch pieces. Keep them separate. Bring the tamarind water to a boil in a non-reactive two or three quart pan (stainless steel works well). Add 1/2 tsp salt, turmeric, arbi and banana pieces and bring to a boil again. Lower heat to simmer, cover and cook until vegetables are cooked. The arbi must be completely cooked until it is soft but not mushy; check one piece to make sure - it should offer no resistance when pierced with a fork. Set aside. Heat oil in a large skillet and add mustard seeds and the dals. When mustard seeds pop and the dals turn pinkish, add asafetida. Add curry leaves, eggplant pieces and and 1/2 tsp salt cook covered for 10 minutes. Stir in okra pieces with a pinch of salt and cook stirring until veggies are tender. Once okra is added, cover only the first five minutes; after that cook on low heat stirring often but gently until they are cooked. Stir in the cooked bananas and arbi including any remaining tamarind broth. Sprinkle the streusel on top and cook stirring occasionally until well mixed and dry, about 10 minutes. Use a folding motion so that the vegetables don't break up and get mushy. Serve hot with plain rice or one pot rasam rice , any dal dishes such as Simple dal or any rasam and plain yogurt or as you wish. Enjoy!! Ghee is the invention of some clever ancient housewife who figured out a simple way to preserve butter. Ghee is simply the rendered milk fat minus the moisture or the milk solids; the added bonus is that ghee does not need any refrigeration. With its browned buttery and nutty flavor, ghee is wonderful to have on hand to add flavor to many dishes from steamed vegetables or toast to complex curries. Rasam, Sambar, Dal, etc. get an extra boost of flavor when the tadka/thalippu for them is made with ghee; and It is used in Middle Eastern and some African cuisines also. Although one can buy ghee at the Indian markets, the flavor of homemade ghee is incomparable! It is deceptively simple to make; it doesn't require undue attention and I usually make it while preparing dinner or am otherwise busy in the kitchen. I like to make small fresh batches so generally use no more than one pound of butter at a time. Heat the butter in a 2 qt pan on low heat. I prefer low heat so that I don't have to watch it constantly. Just peek at it once in a while to make sure it is cooking slowly and not boiling over. Let the butter melt, simmer, and bubble. Just let it be. After about 10 minutes, tip the pan just a little to check the sediment on the bottom of the pan; when it starts getting pinkish, remove from heat. The ghee will continue to cook just a bit more before it starts cooling. Cool until lukewarm and strain through a fine strainer into a clean, dry glass jar. You will have about 12 ounces of ghee. When cool, the ghee will solidify somewhat. Cover and keep in a cool, dry place. Caveat: always use a clean, dry spoon to remove what you need and keep the rest covered to prolong its life and keep it fresh. We love the fresh flavor of new ghee on hot rice, Indian breads like chapatis or rotis, parathas, adais and dosa. Don't throw away the sediments left in the pot and strainer. Amma used to mix it with hot rice with a little salt and pepper and divvy it among all of us children - mmm, what a yummy treat! It is also delicious mixed with rice and simple dal. I often make rasam, simple dal, or sambar etc in the ghee pot or heat up soup and mix in all/some of the sediments. Perhaps you might find your own special way to use it :). This dish is simplicity itself. It is absolutely essential to use the freshest, ripest tomatoes - so it is a great salad to make in the summertime when tomatoes are abundant. The taste of sun-ripened tomatoes, the crunchy bite of red onions and the fragrant cilantro with its citrus overtones - mmm, it is to live for :)! And the freshly roasted cumin adds its nutty, spice magic that marries everything together. We came across some friends whom we hadn't seen in about 15-20 years and the first thing they did was to reminisce about how much they enjoyed this raita :)...... Truly unforgettable! Peel the onion, rinse and pat dry with a paper towel; cut in half end to end and slice crosswise thinly into bite-sized pieces and sprinkle a pinch of salt over them. Wash and dry the chili if using, cut in half lengthwise, remove the core with the seeds and membranes with a small spoon, and slice thinly. Mix the chili with the onion slices. Let marinate while preparing the rest. Toast the cumin seeds in a small skillet without any oil until lightly browned and fragrant. Pour onto a small plate and let cool. Wash and dry the tomatoes. Cut in half, remove and discard the stem end, and slice into bite size pieces. Sort, wash, and dry the cilantro. Remove about an inch or two of the stem end, stack neatly, and slice finely. Crush the cooled cumin seeds in a mortar with the pestle to grind coarsely. Mix the yogurt and sour cream and combine thoroughly with the tomatoes, onions, salt to taste (about 1/2 tsp), half of the ground cumin and most of the cilantro. Sprinkle the rest of the cumin over the raita along with rest of the cilantro. Let sit for about 10 minutes to develop the flavors. Tomatoes get too cold and lose flavor upon refrigeration so it is best if served within an hour of preparation. Serve with any rice dishes such as pulav, any Indian breads, dosa, adai, and/or curries. Serve as a cool salad or side dish or appetizer with other main dishes if you wish. 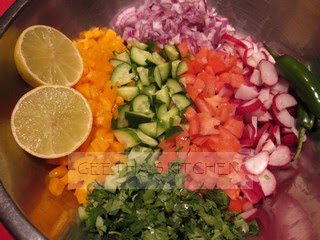 Salaad or Chopped Salad is 'the' dish to accompany a pulav (a rice dish). We loved it so much that no matter how much Salaad Amma made, it was never enough! It is typical of Indian salads in general to use fresh lime or lemon juice and little or no oil as in this salad - Very healthy! Save the oil for another dish. The recipe below is just to give you an idea; the amounts of the veggies can be varied according to your preference. Other veggies such as radishes, bell pepper, etc may be added. Peel the onion and chop finely. Place them in a bowl and sprinkle with a pinch of salt. Cut the chilies in half lengthwise and remove the membranes and seeds with a small spoon. Stack the chili halves and slice thinly; add to the bowl. Cut the lime in half and squeeze the juice over the onion and chilies; discard the rinds. Wash and dry all the veggies. If you use any of the above mentioned cucumbers, peeling is not necessary as the skin is tender and they are never waxed; however, if the cucumbers are waxed, do peel and then proceed as follows. Cut the cucumbers into quarters lengthwise, then slice thinly. Chop the tomatoes into small even pieces, about the size of the cucumber slices. Sort the cilantro to remove any weeds, or yellow leaves; cut off the root ends of stems but do include most of the stems. Stack them neatly and slice finely. Mix all the chopped veggies together with the marinated onions. Allow them to marinate for a few more minutes before serving. Chill if made ahead. I prefer not to chill because cold numbs the tomatoes and they lose their flavor. But if you have to chill this salad, do allow them to come to room temperature before serving. Or prepare all the other veggies except the tomatoes; add them just before serving. Serve with Vegetable Pulav, other rice dishes, or any curries, dals, etc. We love raita but unless made and eaten right away, the cucumbers make it runny with its abundant water content. So at our house zucchinis are the vegetables of choice ever since Amma used them instead of the ubiquitous cucumbers. (It is also a great way to use the tender zucchinis from your exuberant zucchini plants in your garden.) Now the raita is absolutely delicious and is never watery at all! This is exactly how Amma made it. If you do not dairy in your food, try Non-Dairy Zucchini Pachadi/Raita which is almost the same as this one but without the dairy. Wash and chop the tomatoes. Wash and grate the zucchinis. Peel, wash and finely chop the red onion. Sort and wash thoroughly the cilantro, drain well and finely chop; set aside a little for garnish. Mix all the veggies with the coconut and salt in a bowl. Make the tadka/thalippu: heat oil in a small pan and add the mustard and dal. When mustard seeds subside popping and dancing, add asafoetida, curry leaves, ginger and green chili very carefully; cover quickly to avoid hot oil splashing and cook for a couple of minutes to soften the ginger and chili and pour over the veggies. Add yogurt and the sour cream and mix well. Chill until ready to serve. Serve with any rice dish or roti (Indian breads such as Naan, Chapati, etc. ), curries or dal, Dosa, Adai and/or Upma. This raita makes a wonderful appetizer paired with warm chapati or whole wheat tortillas, any kind of chips, and/or fried or roasted papadams.